The 11th G20 summit is scheduled to be held in East China's Hangzhou on Sunday and Monday. Against the backdrop of anti-globalization sentiment spreading across the world, how the summit will influence the global economy has garnered wide attention. This is also the first time that the summit will be hosted by an emerging economy. High expectations have been placed on the summit to inject new vigor and vitality into the G20. Worryingly, opposition to globalization is growing, especially in developed economies. Since the 1990s, transnational corporations have established a global production chain with the help of information and communication technologies. Entrepreneurs from the US and Europe were attracted by low salaries, cheap raw material and potential market in developing countries. Many countries that were isolated from international trade for decades emerged into the US-dominated global economic system after the disintegration of the Soviet Union. They became beneficiaries of globalization overnight. In the first 10 years of the 21st century, the rapid growth of new emerging countries such as China served as the driving force for globalization. China became the world factory, importing a lot of raw materials from other developing countries and exporting manufactured goods including garments and toys to the US and Europe. During the process, China became the biggest trader in the world and it's now the largest trading partner for over 120 countries and regions. However, things have changed now. The Americans have begun to complain of the double-edged effects of the globalization, including the job opportunities and technological advantages they were deprived of. Both Republican presidential candidate Donald Trump and his Democratic rival Hillary Clinton seem to oppose free trade and vowed to help Pittsburgh's steel workers win back their jobs. The immigrant issue is a matter of concern in Europe. The free movement of people was once the most important achievements of the globalization. But with the emergence of the migrant crisis caused by the Syrian war, the sense of insecurity of Europeans has aggravated drastically, dealing a heavy blow to the European integration. Brexit is an indication of the severity of the problem. In countries like France, Germany and Denmark, anti-immigrant parties and political organizations including France's National Front and the Alternative for Germany have strengthened their power. 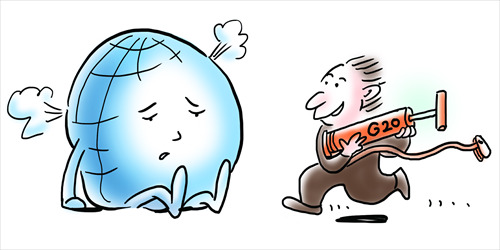 New emerging economies also find it hard to keep their momentum of growth. The economic and social challenges they are grappling with cannot be overlooked. China is facing an economic slowdown, with the economy expected to grow by 6.6 percent in 2016. It also has to undertake tough reforms of the financial system, SOEs and employment. Russia and Brazil, which have long relied on exports of resources, need to undergo a tougher transition. Countries like Turkey are facing the test of domestic political turbulence and terrorism has been blighting African countries such as Nigeria and Kenya. The world hasn't escaped the shadow of the 2008 financial crisis. Heavy debts and the consequent sense of economic insecurity caused a decline in the consumption demands, shrinking trans-border investment and rising trade protectionism. The global economy has slowed down. In the 20 years prior to the outbreak of the financial crisis, the rate of growth in global trade doubled that of production, which reflected the vitality of global trade. But in 2015, global growth only stood at 3.1 percent, and the world trade growth was merely 2.8 percent. It's said that cross-border capital flows have reversed to the level in the 1980s. With growth slowing down and unemployment rising, politicians driven by the anger of the public, turned to promote protectionism and advocated anti-immigrant policies. In the future, the new round of technological revolution brought by artificial intelligence will make more people jobless, even the middle classes. Countries across the world haven't gotten ready for the challenges of a "new economy." Besides, isolationism has been on the rise in some developed countries. According to the Pew polls, the number of those who support the US decreasing overseas engagement is at a 50-year peak. The G20 Hangzhou Summit should focus on these urgent and important economic challenges. China through the summit will put forward a series of cooperative agendas such as developing a blueprint for innovative growth, promoting global infrastructure connectivity as well as mapping out an action plan to provide more economic support to developing countries. Beijing is fully aware of the perils of globalization stagnation. It hopes to promote the "Globalization 2.0" so as to realize more inclusive and sustainable development.